This portion of the Danforth Diamond Learning Center is quite extensive and covers a lot of interesting information about the precious metals used in jewelry manufacturing. It is our goal to better educate our customers to make informed decisions about buying engagement rings. Please click the appropriate link below to go directly to that metal category. Examples of jewelry have been discovered that are thousands of years old. Early unearthed examples of jewelry originate from the Middle East and are from c.3200 BC. Since humans have been able to utilize this metal, they have used it for decorative purposes, recognizing and valuing the beauty, color and the resistance to corrosion and tarnish of this very precious metal. In fact, it was so worshipped that it was known as "The King of Metals." As the human race has advanced and become more prosperous, now, more than any other time in history, people are able to afford this high-value metal and the jewelry it is made into. Gold jewelry, such as a white gold engagement ring, is no longer the preserve of the rich and wealthy, but is purchased and worn by all. Alloys of Gold - Why Not Pure Gold? Pure gold, known in jewelry terms as fine gold, is too soft to be worn as everyday jewelry. It has a hardness and strength similar to lead, and as most can imagine, this would not stand up to much day to day wear and tear, and it will easily bend, dent, dink, scratch etc. So, jewelers use a technique known as "alloying." In this process, other metals such as silver, copper and zinc are mixed with the fine gold to increase the mechanical properties - make it harder and stronger - giving it durability and wear resistance to day to day activities. Fine gold is used in the Middle and Far East as investment jewelry or for jewelry worn by a bride for her dowry. The alloying technique also allows the jeweler to vary the color of the resulting alloy, giving a range of hues for yellow gold alloys and creating families of red, green and white gold alloys. A further added benefit is that as the gold content of the alloy is reduced by alloying, so is the cost, making jewelry more affordable to the buying public - you. But, the jeweler cannot add any amount of alloying elements to his mix. There are very strict rules governing this. The different levels of gold allowed in alloys are known as hallmarks and are measured in "karats," the origins of the name coming from old history when the weight of the gold was compared to a specific number of carob beans. Each karat is a weight measure of fine gold present in the alloy equivalent to 1/24th . So, 14K is 14/24ths or 58.3% fine gold by weight, 18K is 18/24ths or 75% and 22K is 22/24ths or 91.7% fine gold. There are numerous hallmark qualities local to areas such as Europe and the Far East. These include 8K, 9K, 10K, 20K and 21K, but there are only three hallmark qualities recognized internationally: 14K, 18K and 22K. The hallmark is a guarantee of minimum gold content by weight. In the United Kingdom, hallmark testing, known as assaying, is required by law on all jewelry items weighing one gram or more. All assaying has to be done by a government accredited laboratory known as an assay office, who also mark the jewelry with the relevant karatage. This is not compulsory in most countries, including the U.S., and jewelers are allowed to mark their own white gold engagement rings and jewelry. But rest assured, while it may not be compulsory to assay in the U.S., it is still illegal to "under-karat." Under-karating is when an item of jewelry is described as a particular quality, say 18K, but it does not contain the minimum amount of gold required by weight. So with 18K jewelry this is 75% by weight fine gold. But, in another twist, the U.S. has a tolerance of minus 0.3% by weight allowed for manufacturing errors on jewelry items that are un-soldered, and a tolerance of minus 0.7% by weight on jewelry items that have been soldered. This means that for an item to be legally marked as 18K, it must contain a minimum of 74.7% by weight fine gold if it has no solder joints, and 74.3% by weight fine gold if it has a solder joint. We've provided a chart for you to study this information. Rest assured that all Danforth Diamond jewelry is guaranteed to meet a minimum of 75% by weight of fine gold if it is marked 18K, 58.3% if it is marked 14K and 91.7% if it is marked 22K. We do not take allowance of the negative assay tolerance. In fact, here at Danforth Diamond we "over-karat" to make sure you get the best possible product. View the table below to see what your money gets from Danforth Diamond. When considering the frequently asked question "is 18K really that much better than 14K?" you don't just need to consider the weight of gold present in the jewelry, you also need to consider "atoms." Yes there is more gold by weight in an 18K jewelry purchase when compared to one in 14K, but there are also other important factors to consider. All matter on earth is made up of atoms. For each different element, the atom is a specific size and a specific weight. So if we remember middle school math, we take how much something weighs and divide it by the volume it occupies, giving us a quantity known as the "density," sometimes known as "specific gravity." This is important when we consider gold alloys in jewelry. If you choose a 14K gold ring, 58.3% of the weight of the ring is gold, with 41.7% comprising the other alloying metals, usually silver and the base metals copper and zinc. This seems good, over half the weight is gold, BUT......because of the high specific gravity of gold compared to these other metals - each different atom being similar in size but weighing much more - then actual number of gold atoms present is much less. For a 14K yellow gold alloy, only about 30% of the atoms are gold, the rest are made up from the alloying metals! With 18K gold, this number increases significantly. We know that 75% of the weight is gold, but typically 50% or more of the atoms are gold, at least half of them. So 18K gold is a true "gold alloy" with more atoms of gold present than everything else added together. At Danforth Diamond we recommend you purchase at least 14kt yellow or white gold engagement rings and jewelry to make sure you have the quality you deserve. With their very low atomic levels of gold, 10kt alloys tend to be extremely susceptible to both tarnishing and corrosion, and also cracking as a result of this. There are only two true colored metals - gold and copper. All other metals are various shades of grey. Not only is gold a precious, inert and highly reflective metal, it also possesses a naturally beautiful yellow color that has captivated man for thousands of years. Are All Yellow Gold Alloys the Same Color? The most sought after color for any karat gold jewelry is that of pure gold. The full lustered deep yellow is the natural color of gold, unsurpassed by any other. But this color is only possible with pure gold, which is too soft to be used for jewelry manufacture. Because of this, pure gold is alloyed with other metals to improve the mechanical properties of your jewelry - hardness and strength being the most important - so that it will withstand the rigors of everyday use. The upside of alloying is improved properties, but there is a downside. Alloying will change the color of your jewelry, the resulting overall color depending on what metals are alloyed with gold to do this. If the alloy contains a high percentage of copper, the karat gold will possess a pink hue. If the alloy contains a high percentage of silver, it will be a greener shade of yellow. Adding equal amounts of copper and silver will give what is known as a neutral yellow. As the karat level of an alloy decreases, so the yellow color is progressively removed away from that of pure gold. For 14 karat and below, the resulting color may require the addition of zinc to the alloy. This metal, when added to lower karat alloys of gold, silver and copper, helps restore the richness to the color. Danforth Diamond manufactures all 18 karat yellow jewelry using the best alloy in the business. It exhibits a rich yellow color that tends towards the slightly greener hue favored in Europe. Because this particular look has often been described as "regal", our supplier has named the alloy "Royal Yellow", just to let us know that it's the very best of 18 karat alloys. Many other suppliers have tried to copy this, but our supplier has the original formulation, guaranteeing the most beautiful 18 karat jewelry available. The 14 karat yellow jewelry alloy used by Danforth Diamond is, of necessity, a slightly pinker hue due to alloy formulation requirements. But it is still a sought after color for 14 karat yellow gold in the jewelry world. This high karat metal has an extremely desirable color, very close to that of pure gold, but it is generally too soft for use in jewelry applications. It is sometimes used in specific cases and one-off designs, particularly when the piece will be less susceptible to wear and tear, such as a brooch or pin. These are all high copper karat gold alloys and all have similar properties. The difference between the three is usually slight and difficult to perceive unless they are viewed side by side. These colored karat gold alloys were very popular in the latter half of the 19th century and the earlier part of the 20th century, and they are now enjoying resurgence in popularity, especially with the introduction of colored diamonds. The high copper addition is usually at the expense of silver, giving a warm hue that compliments certain gemstones and skin tones. Regardless of karat, white gold alloys used in white gold engagement rings generally fall into two categories: those that use nickel to bleach or those that use palladium. The majority of white gold engagement rings are manufactured using alloys containing nickel as the bleaching agent, because nickel has the strongest "bleaching power" in gold alloys. Palladium is also used to make white gold alloys. Nickel and gold do not mix together particularly well, and after alloying tend to separate into areas that are nickel-rich and gold-rich. This can lead to numerous problems if you purchase your jewelry from a manufacturer that does not know what they are doing. At Danforth Diamond, we only purchase jewelry from experienced reputable manufacturers that have been successfully making jewelry for over 90 years. In Europe, there are laws regulating nickel used in jewelry alloys. This is because a small percentage of the population is allergic to nickel. The European law is known as "The Nickel Directive" and states that no nickel can be used in a material that sits in an open wound, such as after piercing, until healing is complete. It also regulates the design of alloys so that they release nickel below a certain rate when in contact with the skin. While there are no laws governing the use of nickel in jewelry alloys sold in the United States, all jewelry sold by Danforth Diamond is made from alloys that pass the strict European nickel release regulations. As an extra measure, we rhodium plate all white gold jewelry, making sure that you not only get the best white color possible, but also that extra layer of protection when you're wearing your jewelry, making sure that you as the consumer get the very best quality jewelry possible. If you are looking for platinum but can't afford the price tag, palladium is for you. This metal has many of the same qualities as platinum at a much lower cost. It is rarer and more precious than white gold, has a similar price tag, will not tarnish and is more durable over time making it an excellent choice for those looking at 14k white gold. Palladium is a platinum group metal. This metal group includes: platinum, ruthenium, osmium, iridium, and rhodium. These metals are found together in nature and have similar qualities. They are rare, white in color, extremely durable, and unaffected by elements in the air which make other metals tarnish. Palladium alloys used for making jewelry products are typically 95% pure palladium and 5% of other platinum group metals such as iridium and ruthenium. The palladium alloys are white, hypo-allergenic, lightweight and durable. These alloys have a specific gravity close to that of 14k white gold and are close to half the weight by volume of platinum making them an excellent choice for jewelry. Palladium's white color will enhance the appearance of your diamond. The natural white color of palladium is permanent and unlike white gold does not require rhodium plating. Rhodium plating wears away over time making white gold jewelry more yellow in appearance and requires the owner to once again have the setting plated to renew the white color. This is not necessary with palladium. 950 Palladium engagment rings are more durable than white gold engagement rings. Wear testing has shown a 15% longer wear ratio. This is similar to how platinum wears versus gold. Over time palladium will show the signs of everyday wear however the surface is easily restored to the original luster by cleaning and polishing. Platinum is a metal with a range of unique properties that benefit both the jeweler and the customer. Once known as 'silver of little value" it is now the most prestigious of jewelry materials. Be content with the fact that you are wearing the most precious of metals with a platinum engagement ring. The density of platinum is higher than gold, making platinum jewelry about 25% heavier than 18K gold jewelry and 50% heavier than 14K gold jewelry. This gives platinum jewelry its hefty feel and a quality that is unsurpassed. Platinum is also chemically inert, so it will not tarnish, corrode, oxidize or discolor. When you purchase your platinum jewelry from Danforth Diamond, it will be manufactured from a "950" quality platinum alloy. This means that 95% by weight of the metal content is platinum. Compare this to 18K jewelry which only has 75% gold by weight, and 14K that only has 58.3% by weight. Since platinum jewelry purchased from Danforth Diamond is guaranteed to be manufactured from a 950 quality platinum alloy, it makes it ideal for customers who think they may have allergenic problems with certain metals. "Platinum and diamonds - a marriage made in heaven." Platinum's white color and high luster make it the ideal material for setting diamonds. These two are very much a match made in heaven - the most precious of stones set in the most precious of metals. A unique property of platinum is the high luster achieved when polished, unsurpassed by any white gold. This luster gives your platinum engagement ring a brilliant reflective shine. Compare the reflectivities of platinum and white gold and you can see that it reflects with more intensity over a broader spectral wavelength range. This is very significant because the broader the wavelength range a metal reflects over, the whiter it appears, optimizing the look of your chosen diamond. It is a common misconception that platinum is a "hard" metal and platinum alloys are "hard" alloys. This is not the case, but platinum does have a unique property that this misconception may have arisen from. Platinum alloys can "work harden" at a faster rate than a typical karat gold. This is best understood by imagining two pieces of rectangular wire, 2mm thick. One is made from a platinum alloy and one from an 18K yellow gold of similar hardness. Both are in the "annealed" condition i.e. they have been softened so that they can be deformed without cracking. 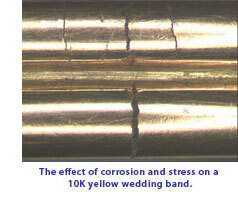 If these pieces of wire are reduced to 1mm thick by rolling, this deformation will harden the metal in both alloys. But, the platinum will harden at a faster rate than the 18K gold. This is important to the jeweler. As an example, if your diamond is set using a platinum tiffany setting, this will probably be soldered onto the shank. The soldering operation on your platinum engagement ring will anneal the setting, making it soft. But, by folding the prongs over and rubbing to set your diamond, the prong tips are hardened. If a platinum alloy is used for the setting material, it will harden at a faster rate and so will be more resistant to wear, so extending the life of your setting before re-tipping is required. Because harder tips are generated from an initially soft metal, platinum is popular when setting delicate stones such as emeralds. Platinum also has the ability to withstand high levels of deformation before it fails. This is known as ductility and is measured as the property known as elongation. Elongation is how long you can stretch a piece of metal until it breaks, measured as a percentage of the test pieces original length. The graph demonstrates that you can stretch platinum alloys further than karat gold alloys until failure occurs, enabling the jeweler to design and manufacture more intricate and complex jewelry. Compared to karat gold alloys, platinum alloys have high wear resistance. While most platinum jewelry will show a "patina of wear" after a while, a look which some wearers often prefer, do not think that your platinum engagment ring is "wearing out". When jewelry wears, microscopic amounts of material are removed from the surface by the action of rubbing up against another ring or the surface of everyday objects. Gold jewelry tends to loose metal and become thinner and lighter with time, eventually requiring repair work to shanks and settings. Platinum tends to be moved about rather than removed, so it will last much longer before repair is required. The bottom line is platinum jewelry is more durable than gold jewelry. Which Platinum Alloy to Use? Although platinum alloys are the ultimate choice for your jewelry purchase, a word of caution must be noted. Some jewelers prefer to use softer alloys such as 95% platinum - 5% iridium or 95% platinum - 5% palladium to aid their manufacturing processes and make their job easier. The resulting jewelry will be very susceptible to scratches, dents and dings and will tend to mis-shape very easily. The Platinum Guild International USA is currently mounting a campaign to warn of the negative aspects of using these very soft alloys, stating that their use can harm the reputation of platinum and give platinum jewelry an undeserved bad name. Here at Danforth DIamond we only use PGIUSA approved alloys, typically 95% platinum - 5% ruthenium, to ensure optimum durability and performance. This may complicate the manufacturing process for our jewelers, but we think the extra effort is worth it to give you, the customer, the best possible product. Sterling Silver - Although silver is classed as a precious metal, in reality it is a fraction of the value of gold and platinum. This is one factor that makes it very popular with the younger generations - it is affordable! This is also a factor that makes it less popular with more mature generations, since it has a low perceived value. The predominant metal used in silver jewelry manufacture is known as sterling silver. Similar to pure gold and platinum, pure silver is far too soft to use for jewelry manufacture, so it is again alloyed to improve its properties. 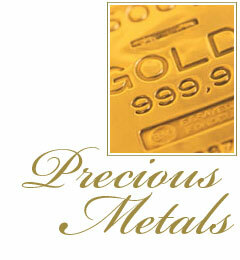 As gold alloys have specific qualities known as karats, silver has a predominant quality known as "sterling." For an item to be marked as sterling, it must contain a minimum of 92.5% silver by weight. In most cases, the standard metal to complete the alloy is copper, although there are some other variations that have been recently introduced into the jewelry market. While silver is the whitest of metals, has the highest reflectivity and is therefore the most lustrous - sterling silver is actually whiter than platinum - it has several drawbacks in the standard alloy form. The main problem with sterling silver is tarnish resistance, or rather the lack of it. Sterling silver will tarnish and discolor very easily. This is because silver and copper both react readily with sulfur to form sulfides. These are predominantly black, brown or purple in color and are often responsible for the discoloration silver jewelry gets with age. Sulfur is present in many things from auto exhaust fumes to certain foodstuffs and medications, so even our own sweat can discolor silver jewelry. 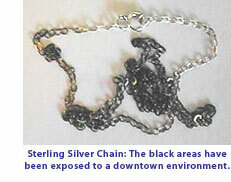 This can often make people think twice before purchasing jewelry manufactured from silver. TruSilver™ - A Great Tarnish-Resistant Alternative to Sterling Silver! Danforth Diamond is happy to offer you an alternative to Sterling Silver in some of our fashion rings. TruSilver™ is a sterling silver alloy which is 4 to 5 times more tarnish resistant than Sterling Silver but costs the same as Sterling and shares the same hardness values and metal color. Review the Fashion Rings section of our website for TruSilver products!